The sculptor of Manhattan’s famous “Charging Bull” near Wall Street says New York City infringed on his legal rights in allowing the smaller “Fearless Girl” statue to stare down the bull. Norman Siegel, the lawyer for sculptor Arturo Di Modica, says the city’s decision to keep the statue in place until February 2018 should be reviewed. Siegel said his client was never consulted before “Fearless Girl” was installed and said he is drawing up paperwork for a possible legal case against the city. Di Modica said his bull statue was meant to be a positive symbol of New York’s fighting spirit, but that the “Fearless Girl” statue turned his into a villain. They say they want the statue of the little girl moved and for Di Modica to be awarded damages for the violation of his legal and statutory rights. New York Mayor Bill de Blasio defended the “Fearless Girl” statue taking to social media to reply against Di Modica’s complaint. The defiant statue by artist Kristen Visbal stares down the much larger bull which, after nearly three decades, has become a landmark for visiting tourists and a symbol of New York City’s financial district. Initially installed on March 8 for International Women’s Day, the 127 centimetre tall bronze girl statuette was meant to be removed on April 2. But New York City extended the installation after favourable press coverage and the public’s warm reception. 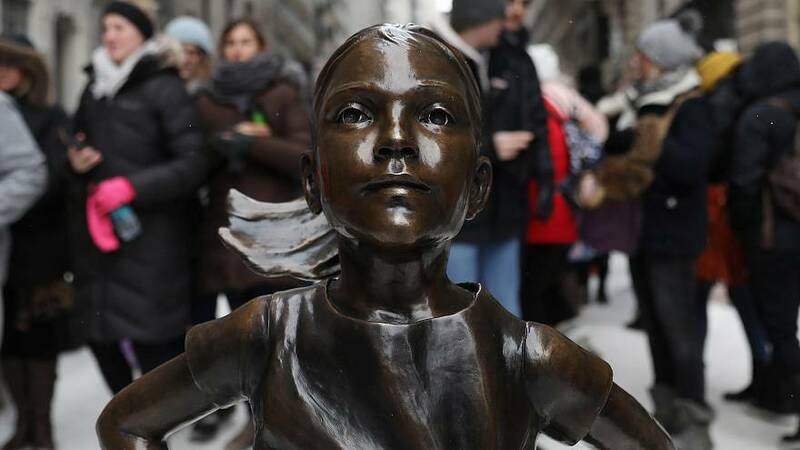 State Street Global Advisors, which had the statue of the girl installed, said it was meant to highlight the need for more women at the top tier of Wall Street companies. State Street said at the time the statue was installed that a quarter of Wall Street’s 3,000 companies have no women directors. But Siegel argues the statue is a publicity stunt and cites the removal of a plaque at the statue’s base, which referred to an exchange trade fund “SHE”, as an admission “Fearless Girl” had an ulterior motive. Di Modica’s bull sculpture was initially installed in front of the New York Stock Exchange as an example of guerrilla art. By popular demand in 1989, and after police had ordered the sculpture removed, it found its permanent home blocks away in Bowling Green Park.